Mysuru: The State-Level 25th National Children’s Science Congress being held at the Vignana Bhavan in KSOU campus is a stage wherein young students with great scientific minds are displaying the use of science and technology for Sustainable Development. 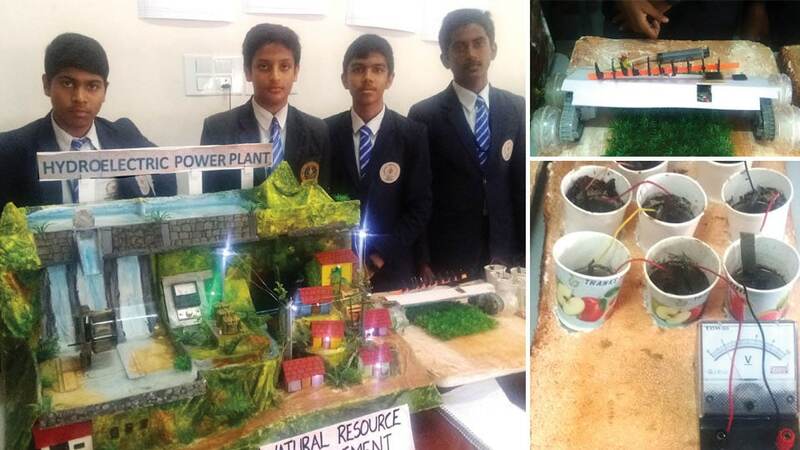 The students from Baden Powell School, Mysuru, have surrounded their models with a common objective of efficient Natural Resource Management. They have setup a model of Hydroelectric Power Plant, Automatic Fertilizer Dispenser and Production of Electricity from mud(earth). The team members consists of four boys — Aryan Jain, Mohammed Zain, Mohammed Owais and K. P. Prithvi. In the Hydroelectric Power Plant Model they have made a model of a dam and a waterfall and an adjacent village. The turbine rotates with the fall of the water and the electricity generated is stored in small lithium polymer batteries and measured with the help of a voltmeter. This stored current is used as a source of electricity for the villages. In the model of the Automatic Fertilizer Dispenser, the students have used solar cells, solar panels and sun boards. With the help of sunlight energy is generated and the automatic fertilizer machine dispenses fertilizers on to the fields. To add more creativity and functionality, they have added the plugging machine and a tool to sow seeds.